Today’s P90X Review will be for P90X Cardio X. This is really a great workout. It’s not super intense, and it’s not crazy hard. It has a little bit of Yoga, some Kenpo X, Plyometrics, and Core Synergistics. All of these “mini” workouts, make up the Cardio X workout. This workout is not seen in the Classic rotation. The Classic rotation uses Plyometrics instead. The Lean Version does use Cardio X, instead of Plyometrics. And the Doubles rotation (meaning you do P90X in the AM and the PM), uses it as one of the second workouts in a given day. I hope that last little bit of information didn’t confuse you. (Further down the page I also want to share with you how you can download P90X, so read to the end to get all the information). In the most simplest terms, Cardio X is either a secondary workout, or its used instead of Plyometrics. If you are doing the Classic rotation, and you are not quite “Plyometrics ready” than just use Cardio X until you’re ready. Just a quick note on Yoga. Before I started doing P90X, I was skeptical on Yoga. I thought I would be in some strange position, doing some strange chant. Let me put your mind at ease. None of that. Yoga at the beginning of this workout is “power yoga”. It’s meant to strengthen your body, develop flexibility, and get your body loosened up and warmed up. Nothing to it, but it will cause you to sweat. For more on Yoga, read an article I wrote called The Benefits of Yoga, and How it Improves Your Fitness. This is followed by your cooldown and you made it, another P90X workout. Don’t forget, track your progress! P90X Worksheets and/or the advanced excel P90X worksheets. You can watch the Making of P90X here. As always, if you have questions, comments, of if you would like to send us your P90X Review or Success Story, you can contact us below. I also wanted to mention our Insanity Reviews. We have reviewed this entire series as well, feel free to jump over and check them out. Insanity is a great program after P90X, something to think about! Beachbody has a new streaming service called Beachbody on Demand. With this service you can stream or download EVERY SINGLE WORKOUT in the Beachbody catalog. P90X is $120. 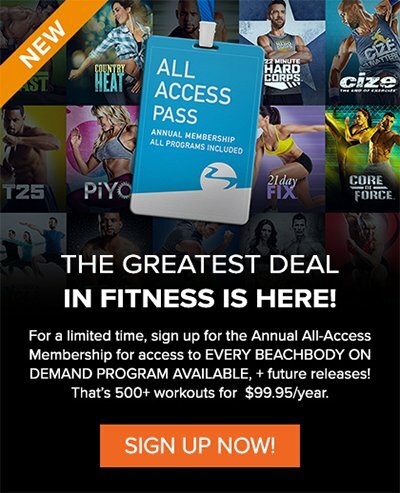 Beachbody on Demand is only $99 per year. It’s an incredibly good deal considering you get P90X, P90X2, P90X3, Insanity, EVERYTHING. You can stream these workouts or download them to your phone/tablet. It also includes all of the new workouts released during the year. This requires an investment in your health, it’s not a free download. But it’s certainly the best option because you get the workouts AND nutrition guides to help you finally get where you want to be. Are you wanting to lose weight? Gain weight (add size)? Get ripped? Just stay healthy and fit? All of the workouts you need to reach your personal goals are in the library. No more gym memberships, no more buying one workout DVD and getting bored, you get all of the workouts and all of the new workouts for a ONE great price. If you’re a beginner, select a workout suitable for a beginner and work your way up to the more advanced workouts. If you’re already advanced, get all the extreme workouts in the Beachbody library. It’s a WIN-WIN no matter what your circumstances are. Check it out by clicking the banner below!